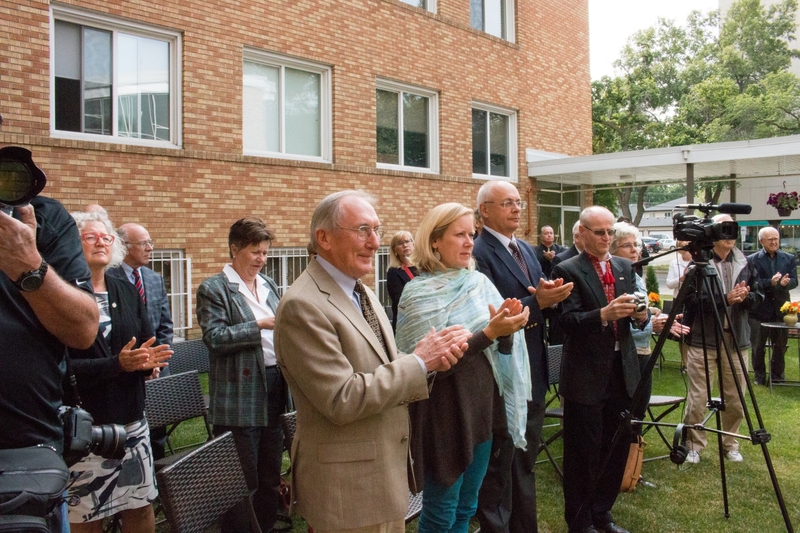 “The grey skies held strong, as the courtyard at St. John’s Institute filled with guests arriving for one of more than 100 historic Canadian unveilings of a plaque that would recall the internment of immigrants from Ukraine and other countries. 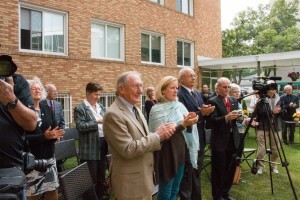 The first ever commemorative event of its kind in Canadian history, a “wave” of unveilings from coast to coast set aside Friday, August 22 as a national day of recognition, commemorating the atrocities of the War Measures Act, which disenfranchised and destroyed families who had come to Canada under the promise of free land and fortune. Andriy Hladyshevsky, QC, and partner with the legal firm, Dentons, delivered a powerful and moving keynote address, remarking on the reasons that current generations need to know this part of Canadian history. For his part, and as president of the Ukrainian Foundation of Taras Shevchenko, Hladyshevsky invested over 2 decades of dedicated involvement with the initiative to achieve redress and recognition for Canada’s abuse against those interned by the government of the day. 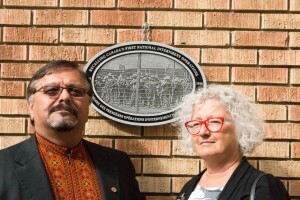 He expressed gratitude to the Canadian Civil Liberties Association and Foundation for their unwavering pursuit of official national recognition for this injustice, and to the Canadian First World War Internment Recognition Fund for making the funding available for these public ceremonies. Linda Duncan, MP for Edmonton Strathcona shared her fervent wishes that all Canadians be wise to their treatment of each other and newcomers from around the globe, especially those areas facing political injustices and turmoil. As a recent newcomer from Ukraine to Canada himself, the afternoon’s master of ceremonies, Ivan Lypovyk, expressed his gratitude to fellow Ukrainians and Canadians both, for working to ensure a stable and successful future for those presently embarking on new lives in Canada. A former temporary foreign worker and resident of St. John’s Institute, Lypovyk forged a new life for himself, his wife, Bohdanna, and baby daughter, Mariya. Through his community work, he has helped to welcome many more Ukrainian immigrants to the city, using his own experiences as a valuable lesson. UCC-APC President, Olesia Luciw-Andryjowycz spoke on behalf of the official organization representing Alberta’s Ukrainian community to the government. Mykola Bilash contributed a moving solo vocal performance, accompanying himself on guitar, while Gordon Gordey, former Artistic Director for Canada’s Ukrainian Shumka Dancers introduced a tribute in dance to those whose freedoms were taken away by their host country. SHUMKA REMEMERS first played to audiences at Shumka’s Remembrance Day Gala in 2011. 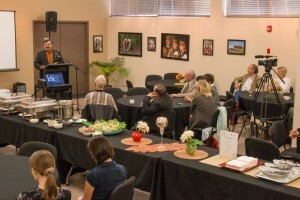 Dr. Bohdan Harasymiw, Professor Emeritus of Political Science, and Secretary of the board of St. John’s Institute thanked the UCCLF and the Shevchenko Foundation for selecting the Institute as one of the sites that will permanently display the plaque in Alberta. A luncheon and reception catered by the Institute concluded the afternoon. Appreciative guests and media stayed to ask questions and record interviews. Special thanks to SJI staff and all involved in the planning, funding, recording and delivery of this historical recognition event.